The metal show of the year? 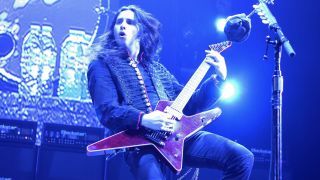 "Without a doubt," says Gus G. "And not only because my greatness is part of it, but because of all of the other fine fellows, you don't want to miss this." The show Gus is so enthused about is the Metal All Stars, and the fine fellows he alludes to are some of the genre's biggest names. That means that Gus will team up with Zakk Wylde, Joey Belladonna, James LaBrie, Geoff Tate, Blasko and David Ellefson, among many others at Brixton Academy on 16 December. Gus explains how he became involved with the event, which is currently touring globally. "I met Gabe Reed, the Metal All Stars promoter, at the NAMM show; I just ran into him in the elevator in all the madness of the show. He said he'd love to have me on the tour." Gus, who is preparing for a smattering of acoustic and solo shows when we speak with him, explains that the show will involve a revolving line-up of these stars jamming through each other's material - and yes, that may well mean a Gus/Zakk shred-off. He adds: "You never know what you'll get to see, you might see me and Zakk jamming together, or you might see me playing some Dream Theater songs with James LaBrie, and Joey Belladonna singing some Ozzy songs with me. "The possibilities are super-cool and endless, you never know who will be jamming with who and what songs you'll be doing. That's the beauty of it. "Look at the body of work of each guy, it is phenomenal. You'll get to hear stuff from Queensrÿche, Dream Theater, Anthrax, Sabbath, Megadeth... just imagine all of the classics that will be heard on that stage on one night. And they're not being played by a cover band, but by the actual dudes that played on the songs." Sticking with that mouthwatering prospect of Gus and Zakk jamming some classic Ozzy licks, surely such a proposition would involve a fair dollop of musical one-upmanship from both sides, wouldn't it? Gus seems to disagree. "If there's any competition it is always good competition. I jammed with Zakk with Ozzy And Friends, and it was a learning experience. He's the kind of player that makes you want to be a super guitarist like he is." Gus wraps up our interview by reassuring us that just because he'll be sharing the stage with a dozen or more metal icons, that doesn't mean he'll be forced to scale down when it comes to gear. "I'll bring over the full display of Blackstar Blackfire amps. My rig is pretty simple. I'll have my signature ESP guitars - it always has to be the full glory." For more info and tour dates, visit the official Metal All Stars site.